CarGurus has 3,579 nationwide Versa Note listings starting at $3,495. With two new top-tier trims, the Versa Note manages to eliminate the one benefit it had going for it: a low price. 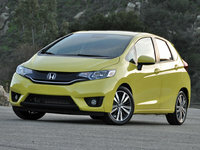 With nearly 10,000 Versas sold in the U.S. every month for the past half-decade, you’ve likely seen a few on the road. More likely, you’ve passed them. In order to infuse some hatchback heat into the brand, Nissan took its very successful Note from Asian markets and added the Versa name for U.S. shores. For 2015 it offers two new trims, the SR and SL, which add some sport pretensions and tech chops to the compact crossover. The Versa Note aims for affordable practicality, with little attention paid to the driving experience, but there are those who have no interest in such things and are simply looking for an affordable car with good gas mileage that can perhaps haul some groceries and passengers without crushing either. For that, the Versa Note might perhaps be the perfect choice, were it not for better examples on the market. The Ford Fiesta comes to mind, but 2015 offers an automotive marketplace where nearly every manufacturer has an entry-level crossover on showroom floors. Sadly, the two new trim levels the Versa Note offers for 2015 raise the price enough to remove the “affordability” part of the argument, and the SR trim that I had for a week doesn’t offer much in return for the inflated price. Regardless of trim, the Versa Note is powered by a 109-hp, 1.6-liter engine. If you go with the base S trim, you’ll be able to wring every bit of usable power out of the little 1.6 via a 5-speed manual transmission. Every other trim is fitted with a continuously variable transmission (CVT) as well as active grille shutters for increased fuel economy. Why the S wouldn’t also get the active grille shutters isn't especially clear. With this SR, you get a $17,530 MSRP that’ll provide 16-inch unique alloys with black inlays, “sporty” front and rear fascias with chrome fog lamps up front, side skirts, a rear spoiler, unique headlamps, and side mirrors with integrated signals. 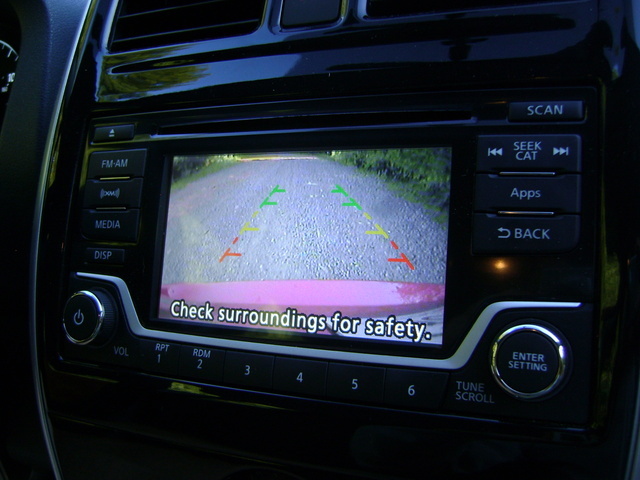 This particular example also had the SR Convenience Package ($660), which included NissanConnect with a 5-inch display, Sirius satellite radio with streaming Bluetooth, a rear-view camera, and the Divide-N-Hide adjustable floor. With an extra $180 for carpeted floor and cargo mats and an $810 destination charge, the drive-away price of the Versa Note SR came to $19,180, which was far too close to $20K for my liking. When it comes to performance, the Versa Note is wholly disappointing. The 1.6-liter engine that powers all Versa Note trims offers 109 hp, 107 lb-ft of torque, 16 valves, variable valve timing, and a whole lot of noise for your trouble. Not to be outdone, the CVT will drone away for you as well, with both creating a disruptive cacophony of seemingly pointless noise when you lean on the accelerator. But pay close attention to the speedometer, because it’s not just an optical illusion—you really are accelerating. Sixty miles per hour will come in just over 10 seconds, and if you’re brave enough to tackle the quarter-mile, it’ll take nearly 18 seconds, and you'll cross the line at a blistering 80 mph. That’s right, getting from 60 to 80 miles per hour will take almost 8 seconds, so plan passing very carefully. Hills provide a special struggle, especially if you’re passing through a particularly windy section. While traversing the Grapevine on my way into L.A., the Versa Note chugged along up the hills but was thrown around by strong winds. Had there been some snow or ice on the roads, I would’ve been wary. The good news is the Versa Note is every bit as efficient as advertised, with 31 mpg city/40 highway resulting in an advertised 35 combined that I easily reached in my trip from Oakland to Joshua Tree and back. This figure is achieved with the help of the aforementioned active grille shutters, which you’ll never notice, and some low-rolling-resistance tires, which you’ll find hard to ignore. Not that I’d go to the Versa Note for the best road feel on the market, but the lack of grip with these tires seemed enough to confuse and confound the stability- and traction-control systems to the point of frustrating intervention. Please understand, I was by no means racing away from stops and attempting to drift around corners. Still, the systems intervened on dry pavement with no visible loose cover to be found. On top of that, the Versa Note offers some of the most inconsistent steering response I’ve ever experienced, with weight varying wildly enough to be dangerous at times. Performance issues aside, the Versa Note is quite the attractive package, especially in this SR trim. It's a shame that with all the “sporty” additions there was no actual attempt to increase the sport capabilities, because the Versa Note looks great tricked out with all the spoilers and skirts and fascias. However, even in this low-mileage example, the side skirts were already coming loose, separating from the body. The same issues continued inside, with the plastic surround from the base of the passenger seat showing the same separation anxiety. Interior material quality didn’t help the situation much, with hard plastics loosely fitting and rattling through the cabin. At $15K this wouldn’t be such a sore spot, but when you’re flirting with $20K, it’s much harder to swallow. 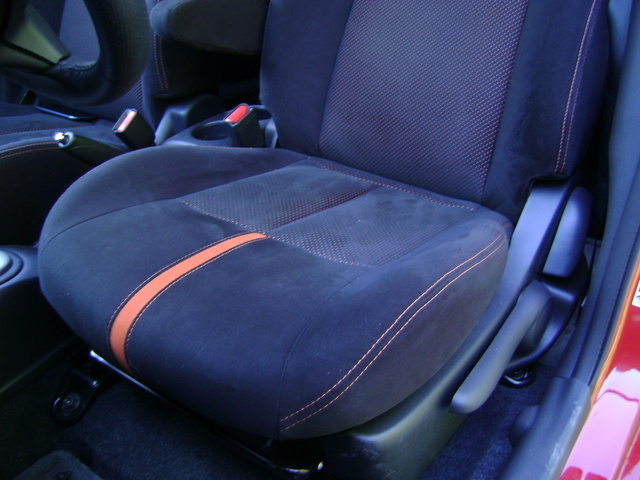 Conversely, the faux suede with the red/orange accents was a nice touch, and the seats held up fine even after hours in the saddle. Special recognition should also be given to the armrest, a necessary feature for a car that proposes to be perfect for longer trips. Gauges were easy to read and even attractive, and the standard tachometer was a welcome addition, if a confusing inclusion with the CVT. I’m a big fan of the Divide-N-Hide system, although I wonder if it’d be better not to relinquish that extra space to the hidden compartments. 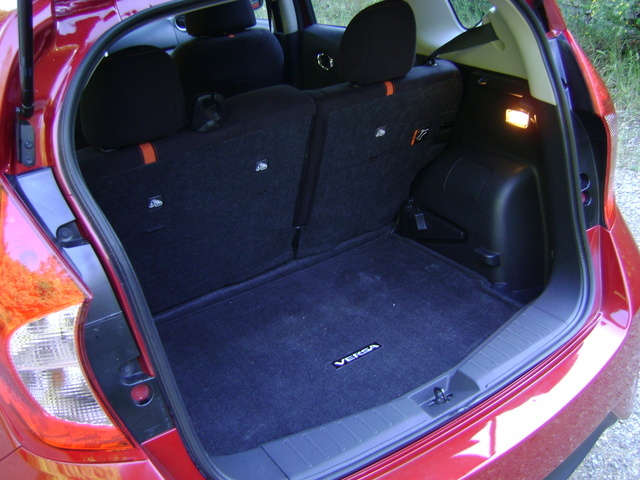 With only 38 cubic feet of total storage, every little bit helps, but it should be noted that there’s a good amount of space in the back seat, especially in the footwell—a nice convenience in an area that's usually cramped in this segment. 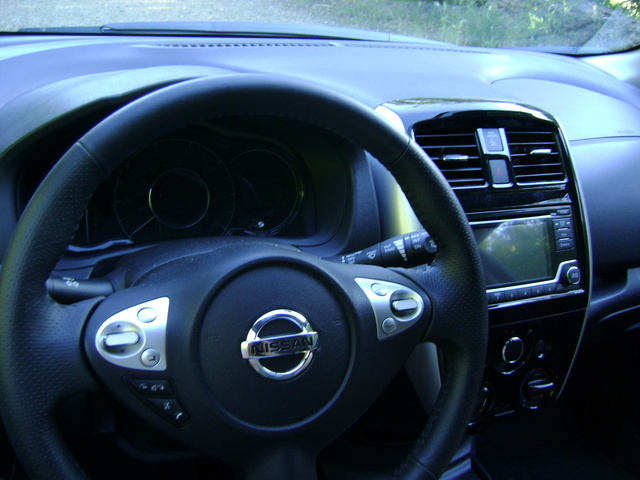 Without the Convenience Package, the Versa Note offers a small amount of technology in the form of a CD player with USB and an Aux input, steering-wheel-mounted controls for audio and Bluetooth for your phone, remote keyless entry, and the typical trip computer. At least it has an outside temperature gauge. Add the Convenience package and you get a 5-inch screen for NissanConnect and the rear-view camera, satellite radio, and streaming audio through Bluetooth. Not a big jump in tech, but it’s also for the low, low price of $660. Even still I’m not sure it’s worth the expense, especially since you’d still be stuck with a 4-speaker stereo. Pack it full of passengers, and you’ll hear nothing. Finally there's a Tech Package for SL trims that will increase screen size to 5.8 inches and add touchscreen capability, along with a navigation system with voice control. Side mirrors get heat here, and you'll also get a 360-degree parking guidance system called the Around View Monitor (AVM). I've used this system before, and while it'll certainly make sure you don't miss anything around your vehicle, it takes a bit of getting used to with all the visual input you're dealing with on-screen, especially with the distortion the cameras bring. I'm not really a fan of anything that takes your eyes off the road for that long, even when parking. Despite the usual suite of safety features—front, side, and curtain-side airbags, antilock brakes (with rear drums), traction and stability control—the Versa Note hasn’t quite kept up with competitors. For an example, stopping from 60 mph should take about 125 feet, which is surprisingly average for a car this light. On top of that, there's the aforementioned tendency for the systems to intervene even when there should be no need—like during relaxed cornering on seemingly dry, smooth pavement. While the National Highway Traffic Safety Administration has awarded the Note a 4-star rating, please consider that individual tests showed a 3-star performance for frontal crashes. This equates to a 21-35% chance of injury sustained during a crash. This is particularly disturbing considering the Note will be predominantly used by families, which should make safety a priority. I also want to reiterate the alarming inconsistencies within the steering modulation. These varied enough in my taste to be considered a safety concern in that they surprised to a point of taking my attention away from the road. While the Note remains one of the most popular cheap cars to own on the market, it’s hard to really recommend it. There are simply too many issues and too many better options on the market, whether you’re looking for something with more power, better driving feel, or higher-class materials and finish. The situation would be bad enough at the base price, but when approaching $20K, it’s an easy decision to make. You can just spend less money and get more car—bottom line. Steer away from the Note and try one of its many competitors instead. 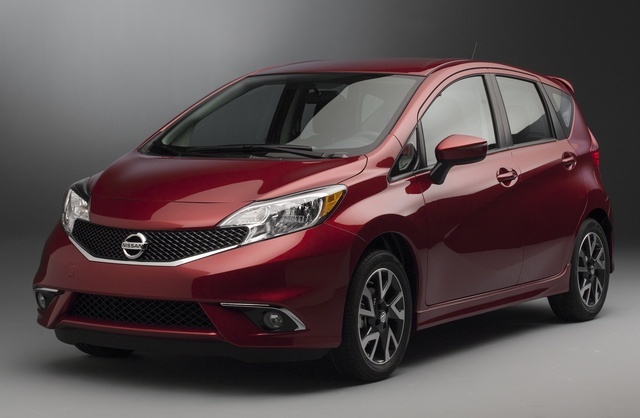 What's your take on the 2015 Nissan Versa Note? davealanbrown Mine is an excellent car. I bought the SL with tech. I love it. And I fit inside the front seat much better than the Fit. 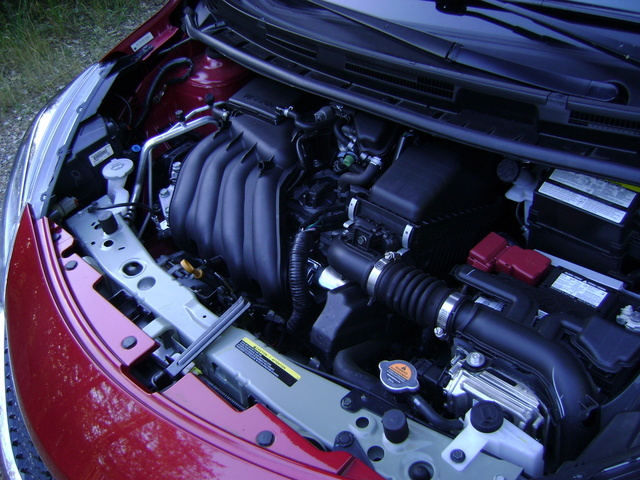 The mileage is really good and the car is very quiet unless accelerating. The CVT doesn't downshift and upshift continually through the mountains like geared transmissions. It just precisely maintains its speed all the way up the grade. And the birds eye view is so helpful when parking. I love the push button start too. It's a great little car. The steering is precise without the need for constant correction. And the ride is very comfortable, not hard. I think you could do much worse. I checked or the competition and was not impressed. If I can't sit in the backseat without my knees and head touching, I don't want it. bones44 I purchased a 2016 note sv to replace a VW TDI sportwagon I am selling back to VW. I am totally satisfied with the versa note. It is a hatchback and can swallow an impressive amount of stuff . Rear seat is more comfortable than the VW and fuel mileage is within a few miles per gallon of what the diesel VW was getting. Ignore the complaints about the engine size because it will effortlessly roll down the highway at speeds that will attract the attention of your friendly state police. Great car, great value for the price and enough tech that works flawlessly.Joel C.
Users ranked 2015 Nissan Versa Note against other cars which they drove/owned. Each ranking was based on 9 categories. Here is the summary of top rankings. 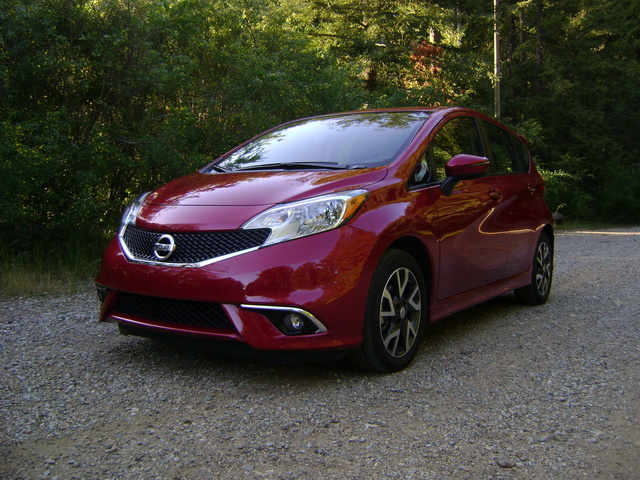 Have you driven a 2015 Nissan Versa Note? my radio does not work at all. no power. nor does the usb port. fuses are all good and the warranty has expired. what could be the real problem? Break light doesnt show when putting my beak handle on. We can i locate the fuse for it. The sude panel dosnt indicated it. Where can i find the fuse at. are engine BELTS covered in my 60,000 mile warrenty? I ordered a hub and bearing assembly for my 2015 nissan versa note s . But I'm confused it doesn't look like all the other ones I seen on the web plus there no gear in the middle.